ANDY’S PICK :: DISNEY MICKEY MOUSE HC VOL 04 HOUSE OF THE SEVEN HAUNTS! 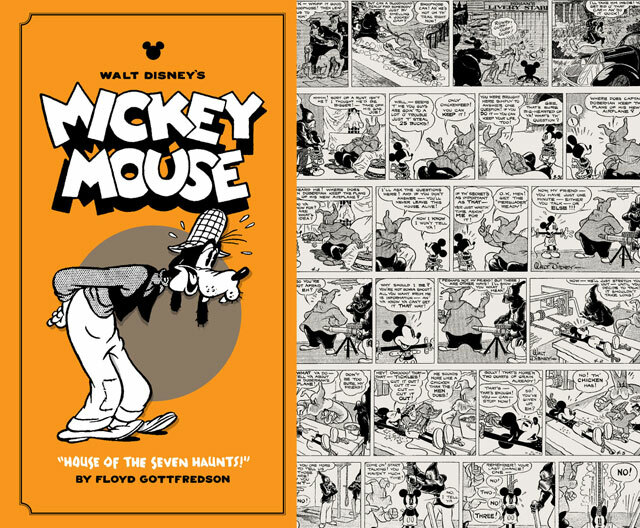 : Over two complete years of Mickey Mouse dailies plotted and drawn by the Mouse Master Floyd Gottfredson. 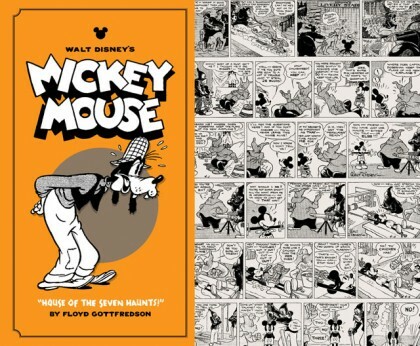 This 300 page book contains the classic stories– Oscar the Ostrich, MM joins the Foreign Legion, Island in the Sky, Jungle Treasure, Monarch of Medioka and the fantastic title tale The House of Seven Haunts which just happens to guest star Goofy and Donald Duck! Plus there is 50 pages of supplementary material including background articles and painting by Mr. Gottfredson. This will (arguably) prove to be the best volume of this great reprint series. For Disney fans, strip fanatics and anyone who loves good comics, it is a must! Thanks very much for the kind words, Andy—I’m sharing them on our Facebook page. As for whether this is the best volume, though… just you wait. Some upcoming books will give this one a run for its money!